This article came my way recently, via a general feed of Bloglovin’ posts – it of course caught my attention, as I myself battled eating disorders, once upon a time. “How a Healthy-Food Obsession Can Eventually Turn Into an Eating Disorder” by YourTango discusses how endeavoring to be a healthy person – a noble, and in fact common pursuit – led to an incredibly unhealthy way of life. It happens far more often than I’d say the broader public knows…or openly talks about. Despite having a different catalyst, I know that scenario all too well. There’s a massive control component to such an illness, not unlike any other addictive disorder. As I’ve maintained, and always will, the only thing that separated me from an alcoholic or drug addict, was simply the poison with which I chose to destroy myself. None of us are better, none of us worse…but all of us need(ed) help to see that we do / did not have the control we believe(d). The reality of our situation at that time is one we will find a million ways to justify. We ignore the signs glaring us in the face, we allow our vision to be clouded by the perceptions we want to have (“I have control of this”…sound familiar? ), and we try rather desperately to convince ourselves of truths we know – deep down – to be false. It’s terrifying…and it can be our end if we allow to be. Even more frightening is that while human beings have always been a visual species (eg: I see a massive, tusked animal charging at me, I need to run for safety) there has never been MORE pressure than the present. And I mean that in an unfortunately negative way. Social Media has brought with it several new layers of “I have to be perfect”...or at least present myself that way. Some people bravely portray the “real” stuff…the nitty, gritty imperfections of life, of our bodies, etc. But the overwhelming bulk of it is a filtered, seemingly flawless facade, leaving not only the more vulnerable of the crowd questioning themselves and how they appear…but even the stronger and more secure individuals. Even when a post is meant to be happy, supportive, motivational…there are bruises, bumps, and failures beneath the surface. Ones we may never see. 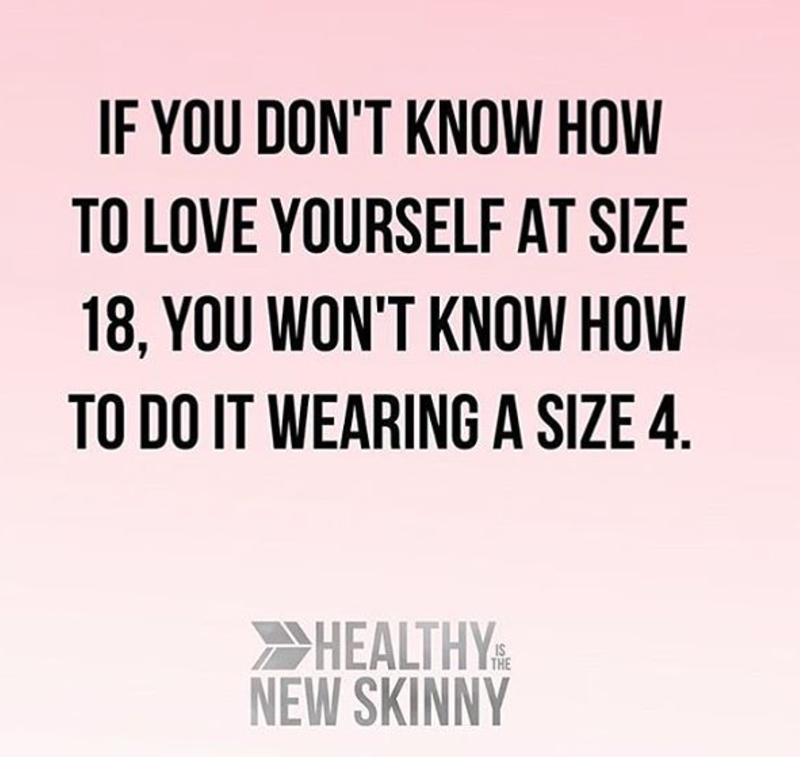 When I saw the quotation above about loving your size I thought “that’s a huge part of it…” If you don’t love yourself the way you are, you aren’t necessarily going to love yourself MORE when you eat less, get high, get drunk, get more money, get a new job ect. . . Sometimes you actually feel worse, leading to more abusing of the self. In my own case, and many I know, there are layers of insecurities, breakdowns in self confidence, frustrations with things we are not capable of controlling. Any number of internal battles could lead to seeking external sources capable of dulling the pain, and allowing us to avoid facing ourselves fully. But, at the end of the day, being plagued with a deep-rooted turmoil is often a common thread. Sometimes those struggles last after the worst of the storm has past. It never is about being recovered so much as we are all still IN recovery. We still have to take each day one at a time, and be open to where we need some work and help. We have to increase our awareness so we know when we stumble. . . And we need to seek a courageous path so we can take ALL the steps we need to get better. Yes, we SHOULD love ourselves. But we don’t’ have to beat ourselves up if we don’t every second of the day – self-love is hammered home so much that this message gets lost a lot of the time. Beating yourself up for being hard on yourself is adding more judgment and hurt on top of what you already have. You’re human. Trying to will reality away, or pretending, isn’t the answer. It’s about learning to observe and be more gentle with ourselves – re-wiring a habit takes time and overnight expectations will derail someone very quickly. In order for real and lasting change we must recognize that we are out of control. Of our thoughts, in this case, in particular – thoughts lead to actions, right? When we observe negative thought patterns, and allow ourselves to see without judgment…we are on the way to healing. I personally work on this daily – and sometimes it feels like a massive struggle. I’ll hear myself say something, or catch a negative thought… Rather than try to squash it, I notice it, I hear it, I feel it, and then I either reframe it, or replace it with something positive. It hasn’t necessarily stopped the pattern fully, but it’s a step in the right direction. Another saving grace for me is having a husband who is good about pointing out when I’m putting myself down – I need that reminder. I need to be called on the behavior. Even if I don’t believe the jab I’ve aimed at myself…I spoke it. And the Universe hears EVERYTHING. We also need to accept and allow that help is OKAY. Uncovering the true reasons as to why we are “self medicating,” seeking a “better looking / skinner” version of ourselves, spewing negative things to ourselves about ourselves…is necessary for growth and “re-wiring.” Having a professional to guide us through that process of discovery is a massive help – there are countless variations and modalities available, ensuring that no matter what works best for you, you are sure to find something. Getting back to the specifics of the quotation above… Health is important, and looking great helps us feel more confident – it’s both mind and body at work, and really can’t be contested. Having the goal to lose weight, for example, and with it gain more energy, better health, more confidence…that’s GREAT. It’s a wonderful goal, and no one should feel badly about it. What one must understand, however, is that no one thing is responsible for our happiness. No ONE thing is the magic ingredient that “if I just had it, life would be perfect.” That doesn’t exist. Having been through my own issues with dying-of-starvation and malnutrition – a very slow and painful death at that – the quote really hit home. I was on the opposite side of it, at a meager 90-something pounds. . .and it was horrifying. While I have many areas in which to continue my learning and growth, I know that I have come leagues from that dark, dark place. It’s OKAY to be human, which means it’s ALSO okay to be imperfect. In that imperfection lies a good deal of your beauty. Remind yourself of that…and remind yourself OFTEN.